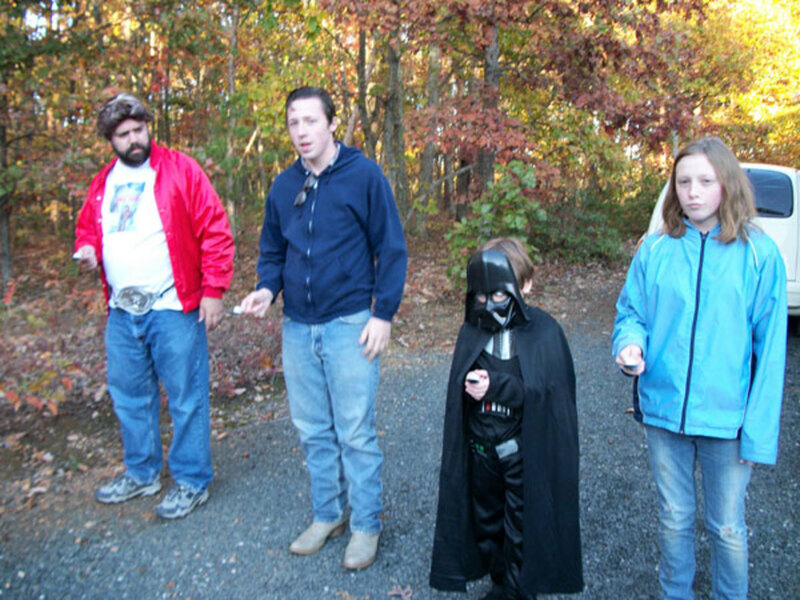 Faye has a Halloween party for her family every year and the kids wear costumes and play games. Everyone has lots of fun. 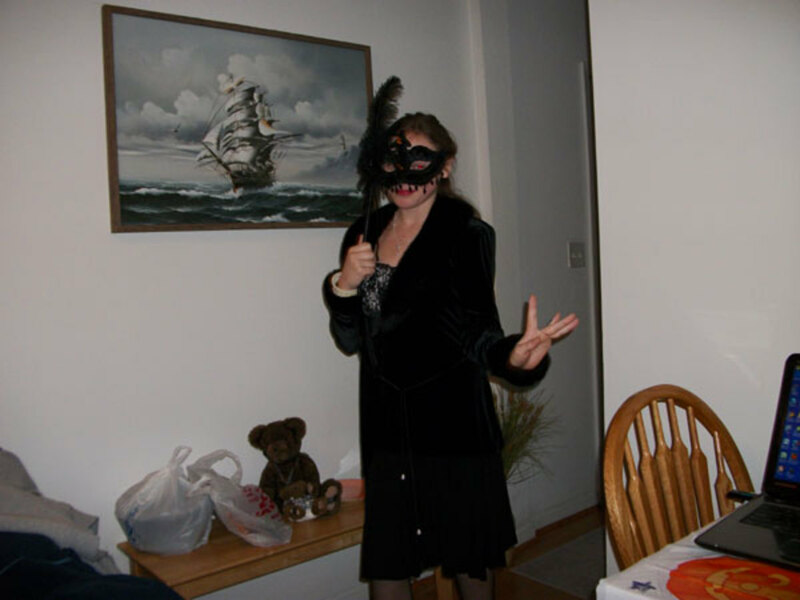 Our family has a Halloween party every year! 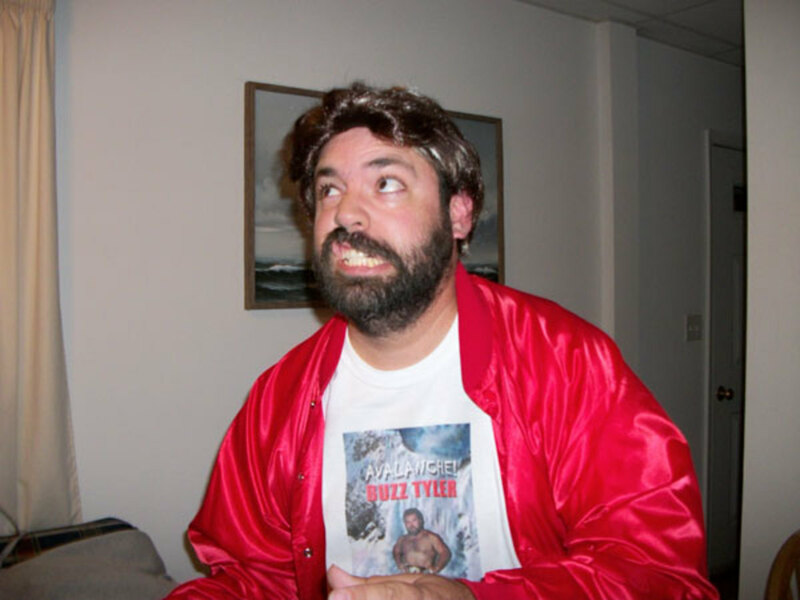 Our family has a Halloween party every year, and I'd like to share with you a few of the fun things we've done over the years. I've included how to play a few of our favorite games, including Capture the Witch, Eyeball Race, and Mummy Wrap Race. 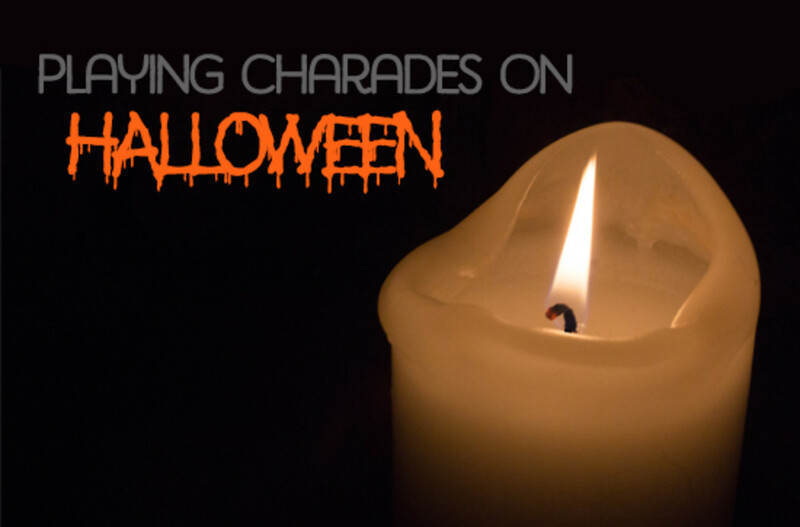 Plus, ideas for a Costume Contest and an easy Jack-O-Lantern Face Craft. We always end the night by watching a favorite Halloween movie! I hope these ideas will help you to plan a fun party. This game is a variation of the Egg on a Spoon Relay Race. The object of the Eyeball Race is to be the first to carry your "eyeball" on a spoon, without touching it or dropping it, until you reach the finish line. We used wrapped gumball eyeballs and kitchen spoons. You can also use ping pong balls and draw on an eye. I think you can even buy ping pong balls that look like eyeballs. We did not do it as a relay race, but you can if you prefer. This was a fun game, and not as easy as it sounds! Mark off a starting line and a finish line, about 50 feet apart. Give all participants an eyeball and a spoon. Instruct participants to place their eyeball on the spoon. Instruct that the object is to keep the eyeball on the spoon, without touching it, until they reach the finish line. Have someone at the finish line to judge the winner. And, go! Be careful! If you drop the eyeball, you are out. 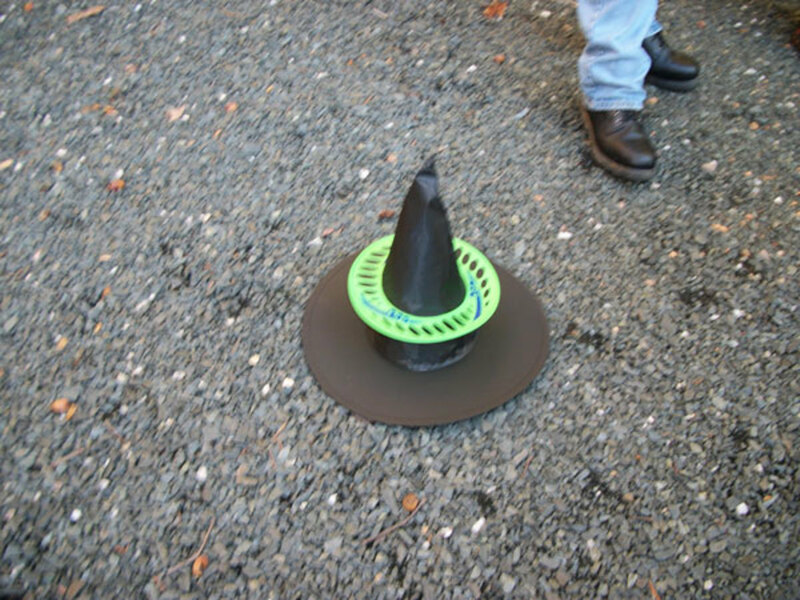 To play the Capture the Witch Halloween game you need a costume Witch's Hat and a Frisbee that has a hole in the middle. The hat should be easy to find at this time of year, and you probably already have a Frisbee on hand. I usually store these with my Halloween decorations so I'll have them ready for the next year. 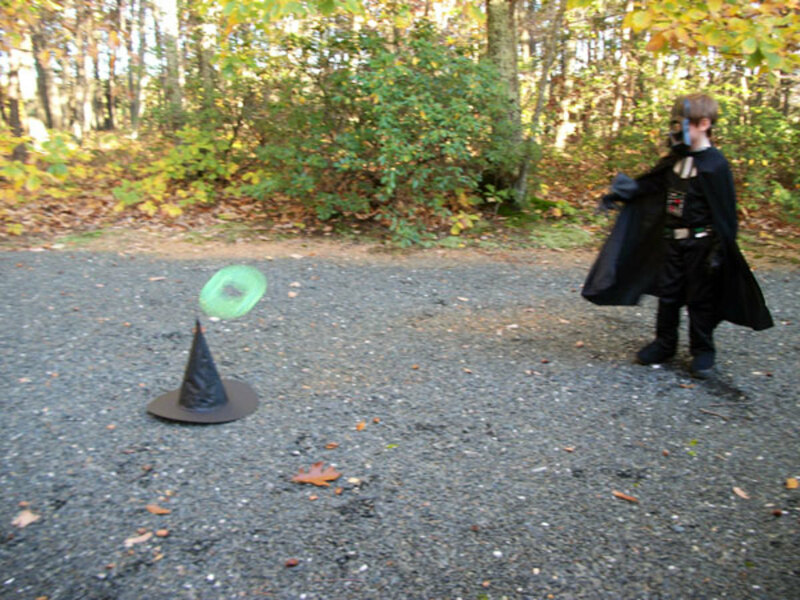 The object is to throw the Frisbee and have it land over the point of the witches hat. Everyone gets 3 tries throwing the Frisbee. If the Frisbee lands on the hat brim, you get 5 points. 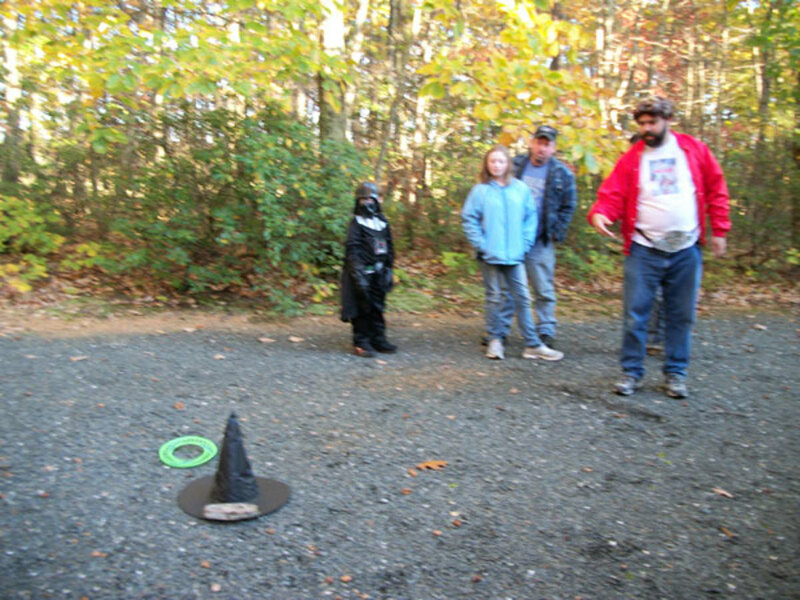 If the Frisbee lands over the point of the hat, it "Captures the Witch" and earns 20 points. The person with the most points after everyone has 3 tries wins the game. You can use a different point system if you like, because we just made this up. There will still be a winner, even if no one makes a capture. Everyone in the family took a try at this game, even Scott! (Scottie and Lacey's dad) We had a difficult challenge because the wind kept blowing the Frisbee in the wrong direction and the hat kept flying away! We finally put a rock on the hat to keep it down. This game could also be played inside if you have the space. We had fun playing it outside, even with the wind. Scott was the winner in this game! Brian didn't get any points on this try. 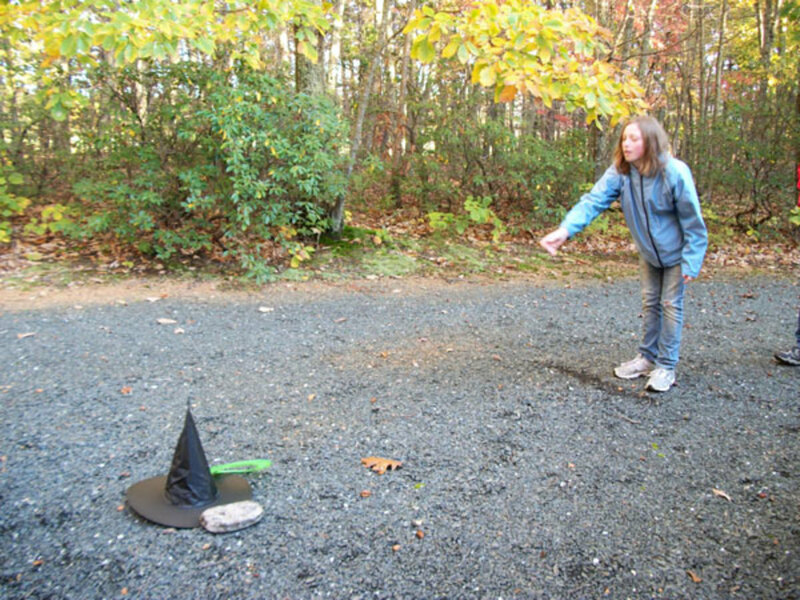 You can see that we had to put a rock on the hat to keep it from blowing away. And, note the line in the gravel to mark where to stand behind. Douglas is so close! The disadvantage of playing this outside is that the wind blows the Frisbee. That's 5 points for Lacey! It's not easy to get that witch captured! Scott is the winner! He captured the witch! 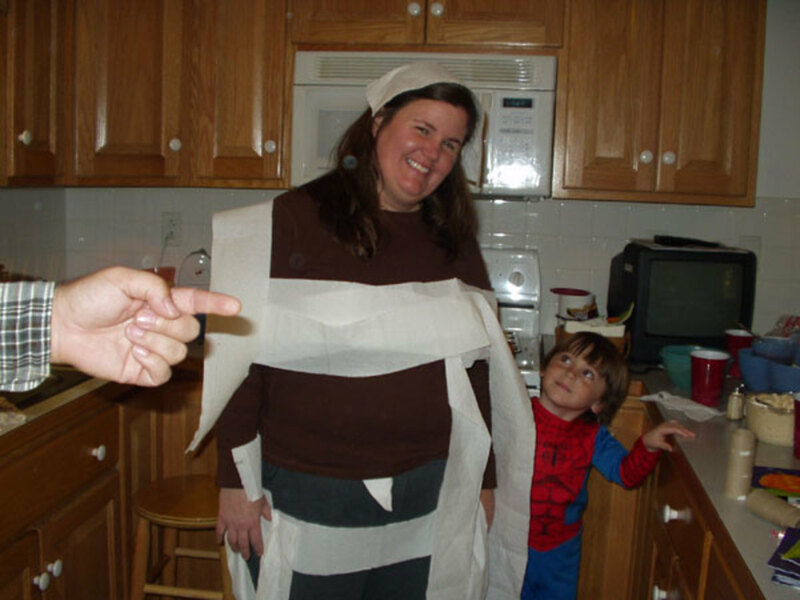 The object of the Mummy Wrap Race is to be the first to finish completely wrapping your "mummy" in toilet paper within a set time limit. Usually the time limit is 5 minutes. If more than one wrapper finishes before the time is up, award first, second, third, etc. prizes. Clear a spot large enough for everyone participating to have plenty of room for wrapping their mummy. If space is limited, play this in groups of two teams each. Have a teams made up of two people. One as the mummy, one as the wrapper. 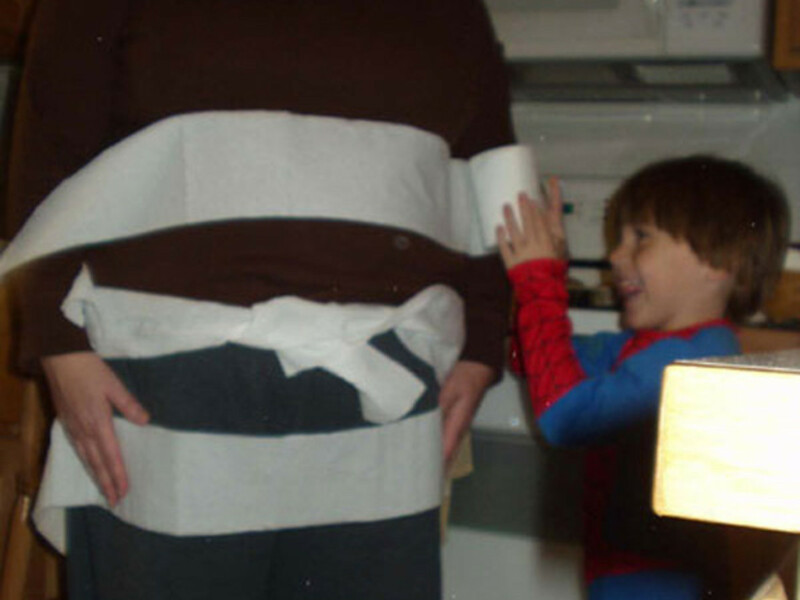 Give the wrapper 2 rolls of toilet paper. Explain the object of the race. Someone start the race and keep the time. 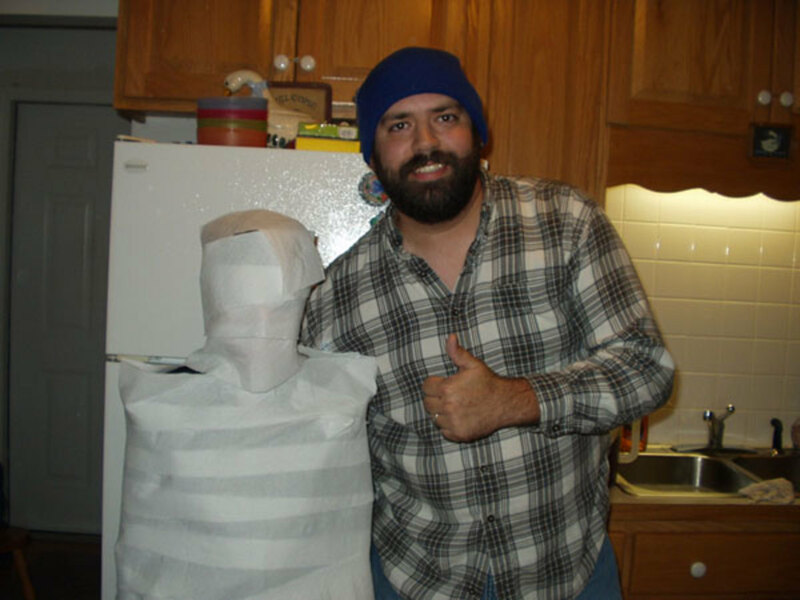 The first to finish wrapping their mummy wins the race! The others can keep going for next placing. When buying the toilet paper, choose a brand that is 2-ply and fairly strong. This is game is meant for any age. If there are younger children playing, you could have two wrappers. Be careful and do not completely wrap the nose and cut off air! It's easier to have arms by sides and feet together, but if you want a challenge, wrap the arms and legs separately. Please do not use duct tape or saran wrap for this game, as there could be potential danger in doing so. Brian has got it going on! Douglas has the right idea! Scottie is concentrating on getting the toilet paper to stay in place. It's quite a challenge! Douglas tried hard, but his wrap wouldn't cooperate! The object is having fun, and even small kids love it! Scottie's Mummy is a Mess! 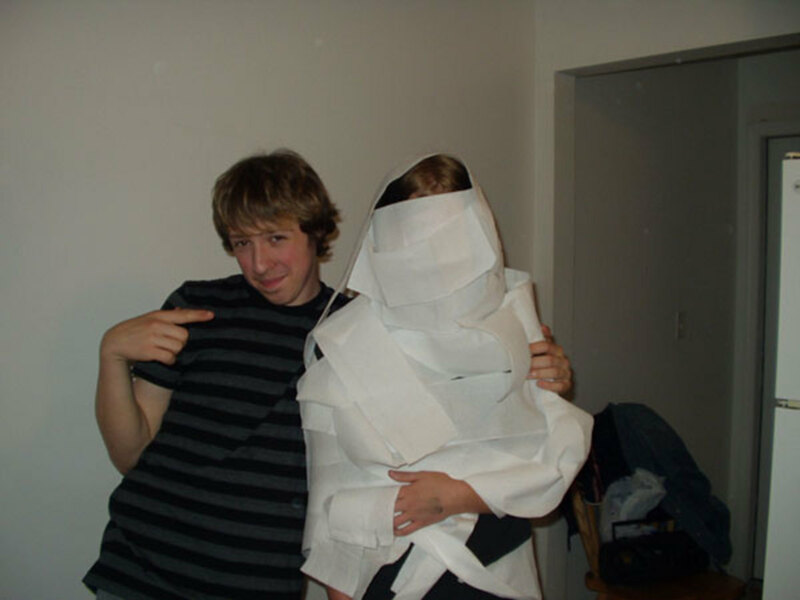 Brian finished wrapping his mummy (Lacey) and she looks great! No wrap falling off and nice and neat. How does he do it? 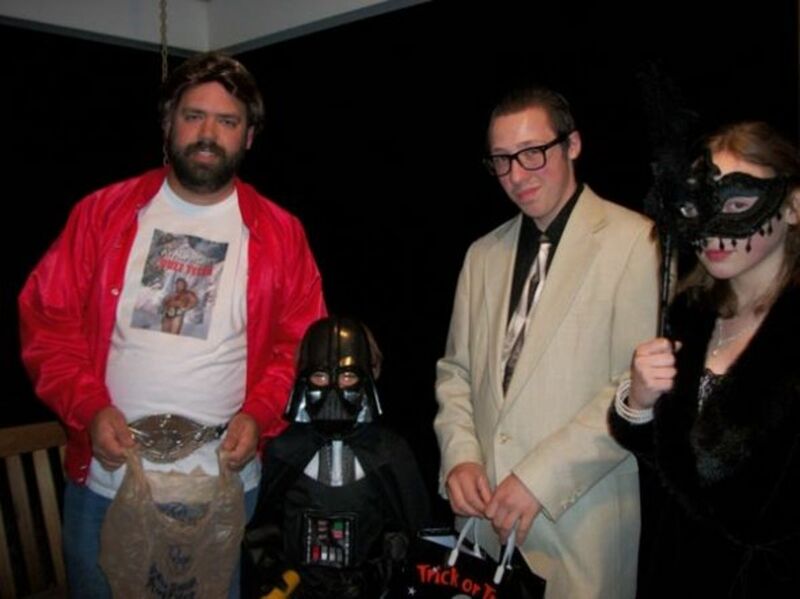 A fun thing to do at any Halloween party is a costume contest. Usually, only a few members of our family dress up, and the others vote for their favorite. 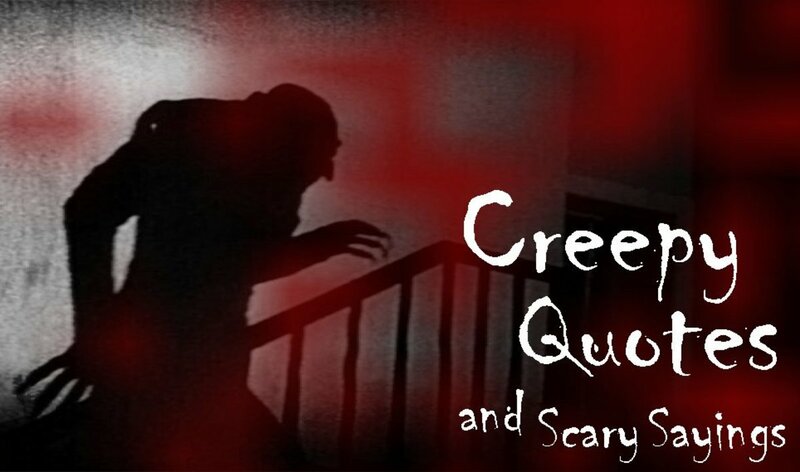 To help out the voters, we have a few categories such as Cutest, Most Original, and Most Scary. By the time we do that, everyone in the contest is assured a prize! It's all for fun anyway, and the kids like the suspense. Which is Your Favorite Costume? 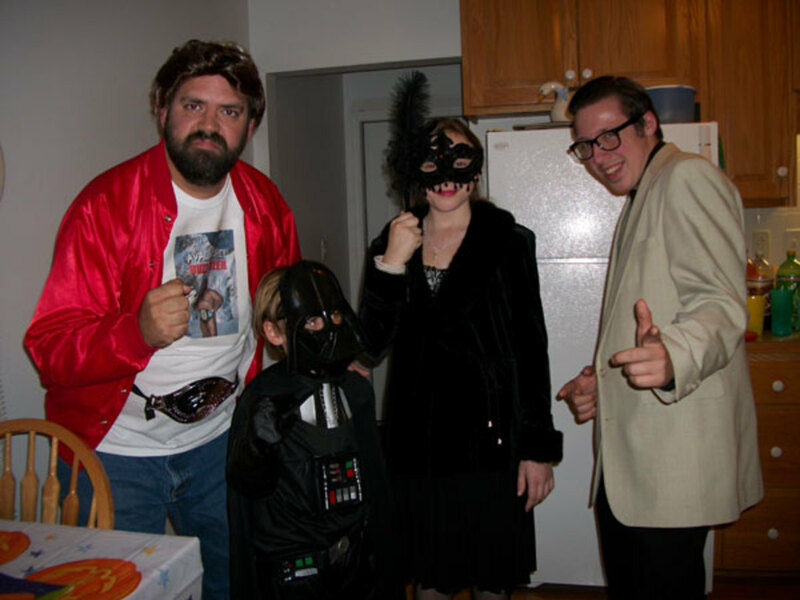 One House Trick-or-Treat at Grandma's, including Wrestler Buzz Tyler, Darth Vader, Buddy Holly, and the Countess of Deadwood Manor. 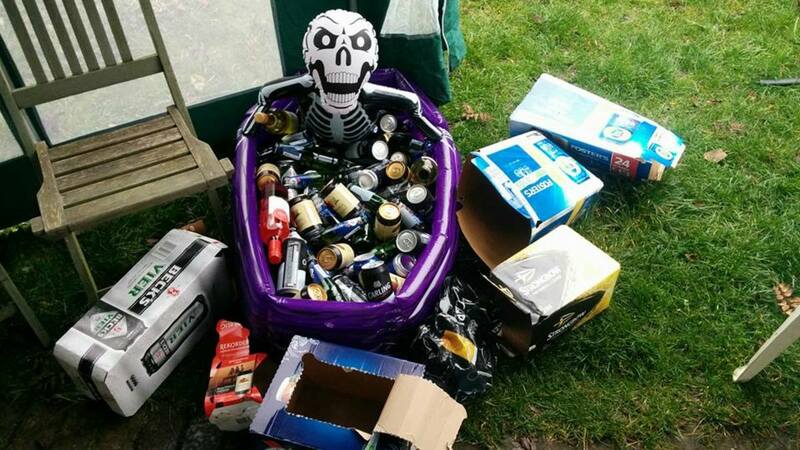 Every year we have what we call, One House Trick-or-Treat. The "one house" is mine! I know you've probably never heard of such a thing and may think it's a crazy idea. 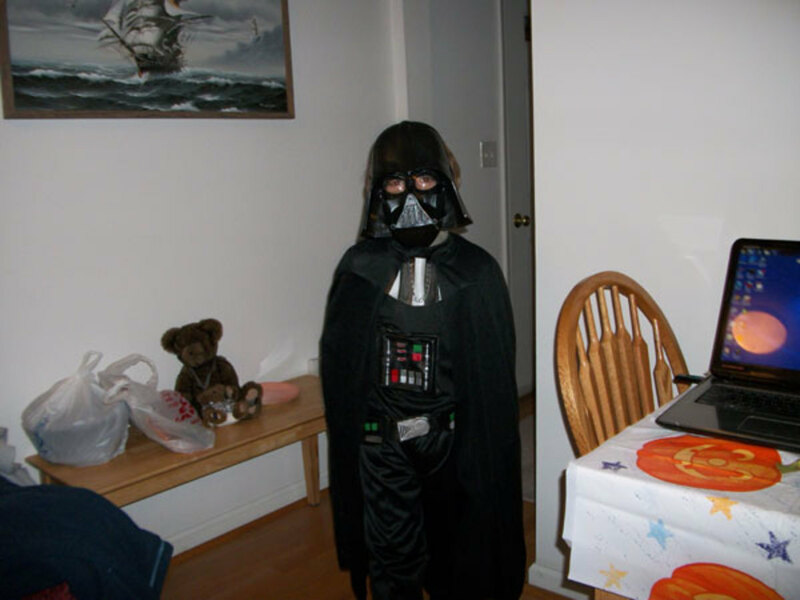 We started it when my oldest grandchild, Scottie, was little and his mother didn't want to take him out to trick-or-treat in the neighborhood. 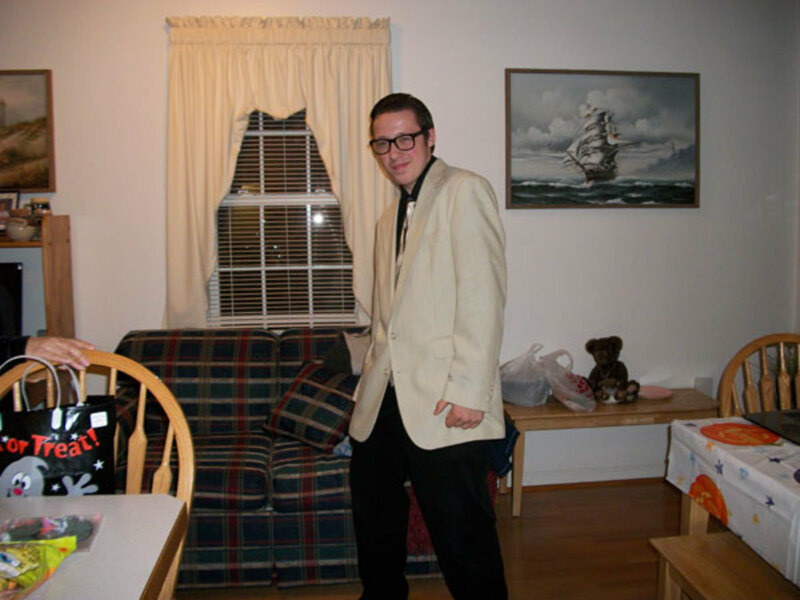 My son (Scottie's Uncle Brian) didn't want him to miss out on the fun of going door to door, so he came up with the idea of going to several different doors at just my house. As you can see, Brian also joins in the fun and Scottie still loves it, too. 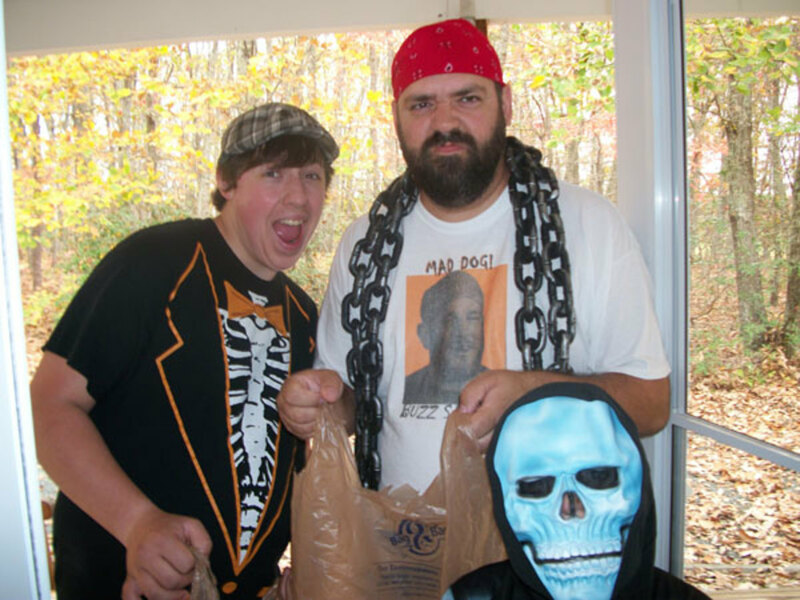 We have been doing One House Trick-or-Treat for about 20 years. You can ad-lib and make it into an entertaining event. Brian always has me give him a bogus treat, like rocks or something silly, or refuse to give him a treat at all. That makes it more fun for the little ones. Also, changing up who or what "answers the door" makes extra fun. I recommend your family try this instead of going out in the neighborhood. You'll know it's safe and any age can participate. Pick out several outside and inside doors of your house that you want to use for this game. Plan an order for visiting the doors. 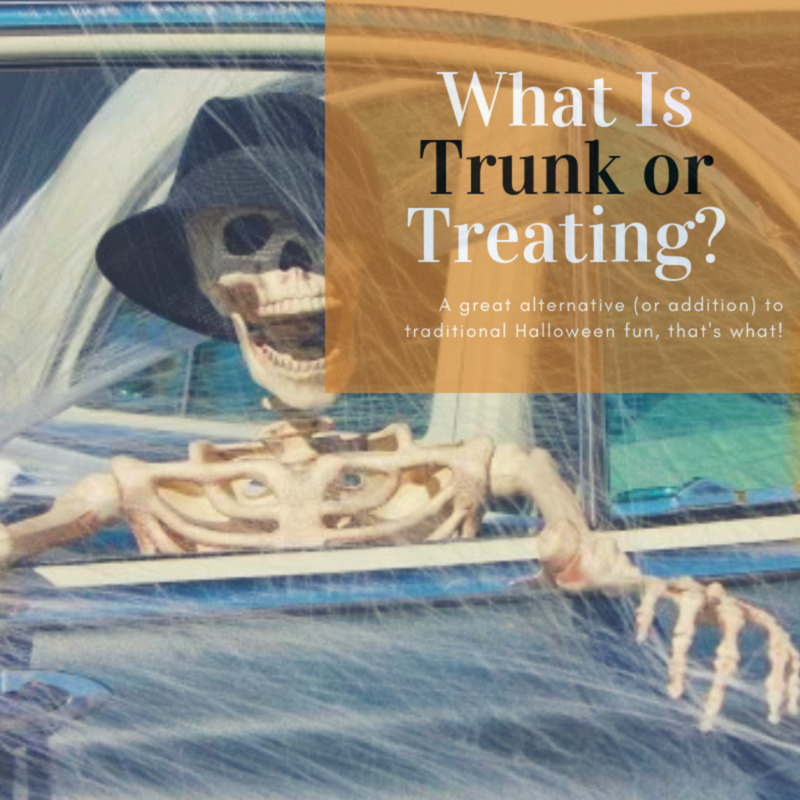 Have someone designated for each door to give out treats. This can be the same person for all doors. It works better with more than one person to man doors. Note: The door opener should make silly conversation and pretend that they have never seen these kids before. Use your imagination to make it more fun. 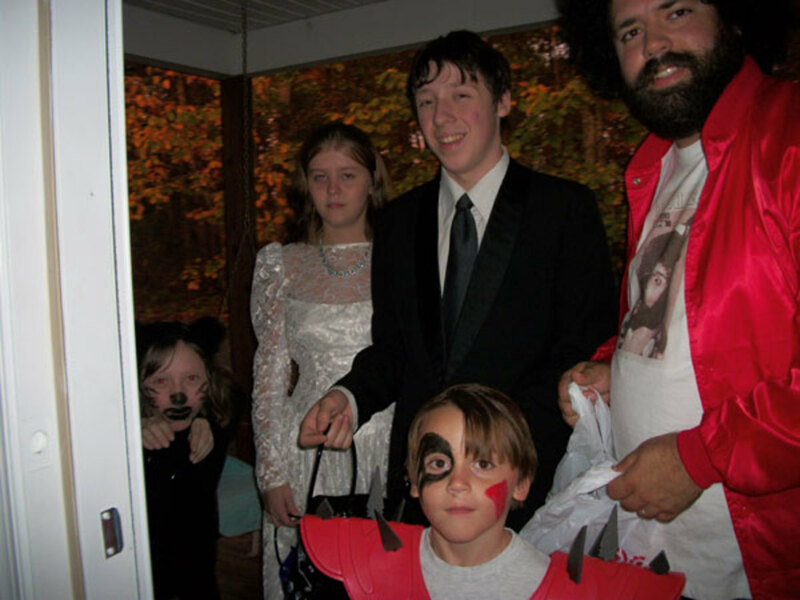 Have kids go to each door (in the order you've established), knock on door, and yell TRICK OR TREAT! The door opener gives each child a treat. The child then proceeds to the next door until all doors are done. This is how we do it: Anyone that is trick-or-treating starts out at my front door, knocks, yells trick-or-treat, and I give them a treat. Next, they walk on over to the side door and repeat the process. And, then they go to the back door. I always act like I've never seen them before and compliment them on their costumes. After all outside doors are done, they come inside and trick-or-treat at most of my inside doors! I have to rush to get behind each door before they get there. It helps to have more than one person as a door opener. One year my daughter helped me with alternate doors. In between she actually changed clothes and when they knocked at the next door, she pretended to be someone entirely different. She talked with different accents, too. I have to tell you, it was so funny, and totally unexpected. This game is fun for everyone! 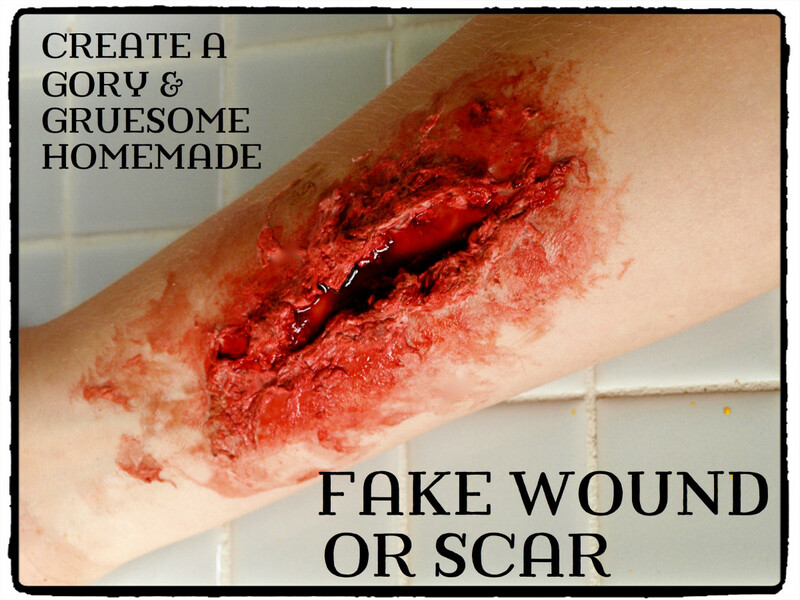 This is a fun craft activity to do at your Halloween party, and is great for any age. 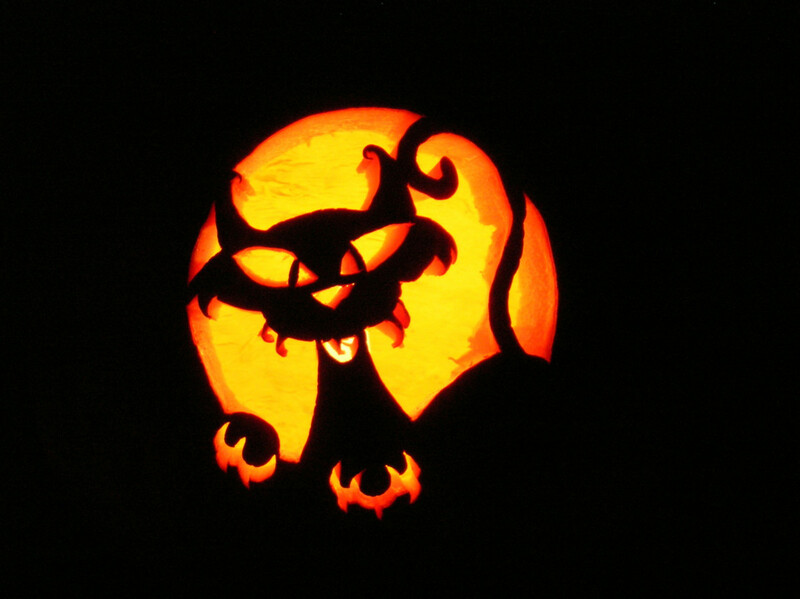 If you don't want to carve real pumpkins, you can still make Jack-O-Lantern faces to decorate your home! 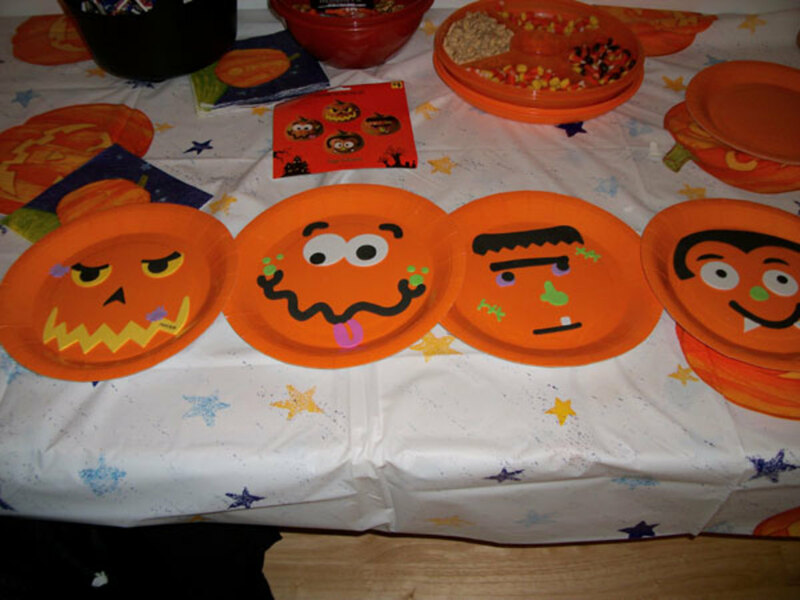 We used solid orange paper plates and stick-on jack-o-lantern face parts that we bought at the local dollar store. You could also use these stickers on real pumpkins. 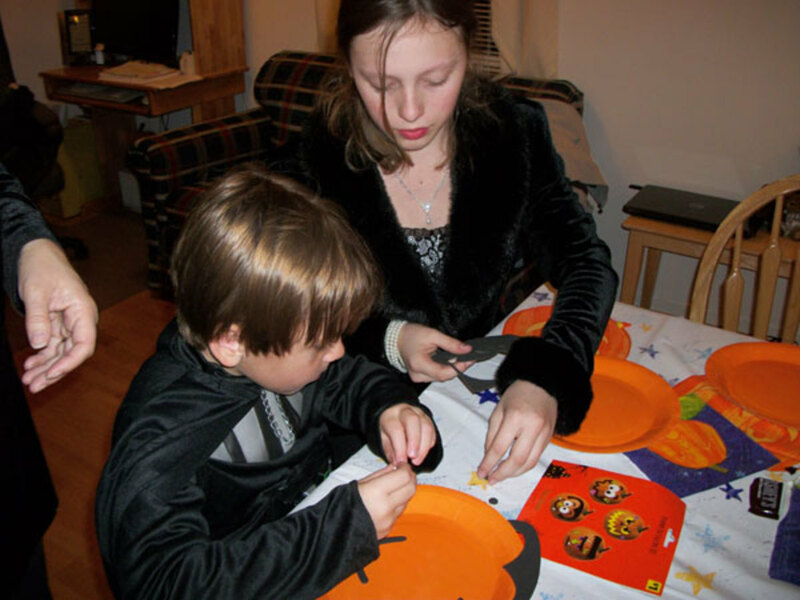 Lacey and Douglas had fun getting creative and decorating the plates as jack-o-lanterns. After the party, they took them home to decorate their rooms! The last thing we do at our Halloween party is movie time! 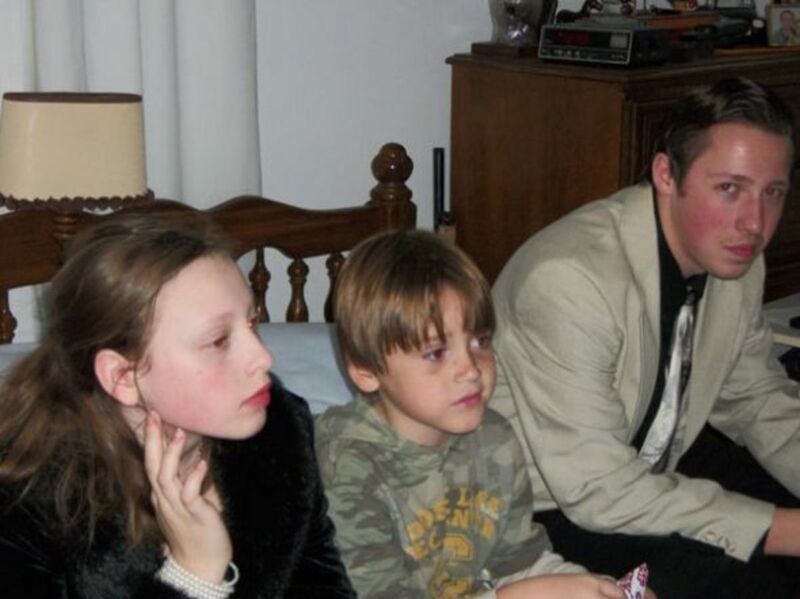 After the food is all eaten, games all played, trick-or-treating all done...the kids all climb on my bed and watch a Halloween movie on the big screen television. We traditionally watch a Scooby Doo Halloween movie. We either buy a new release or rent an older one from the library. Now it's time relax, watch a movie, and eat popcorn! What a fun party we've had! Everyone loves watching a Halloween movie on the big TV in the bedroom. 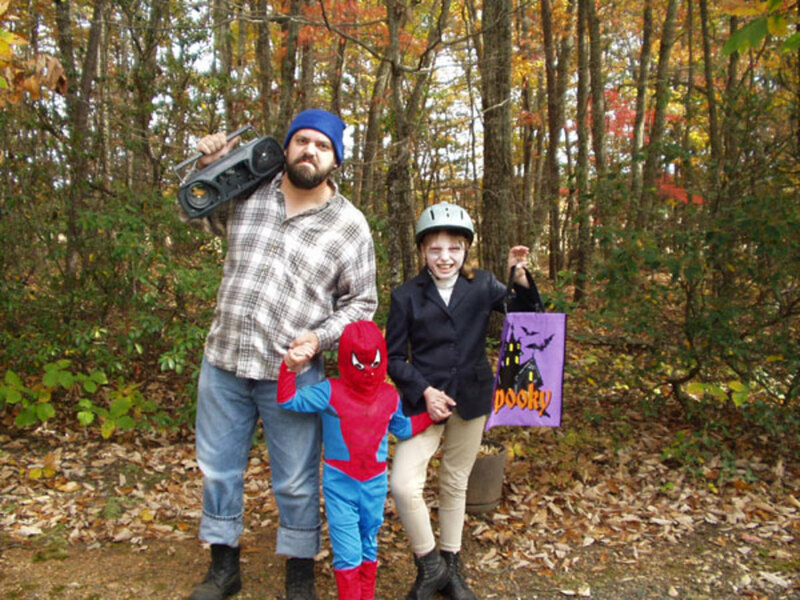 Spider-Man and his friends are ready to trick-or-treat! 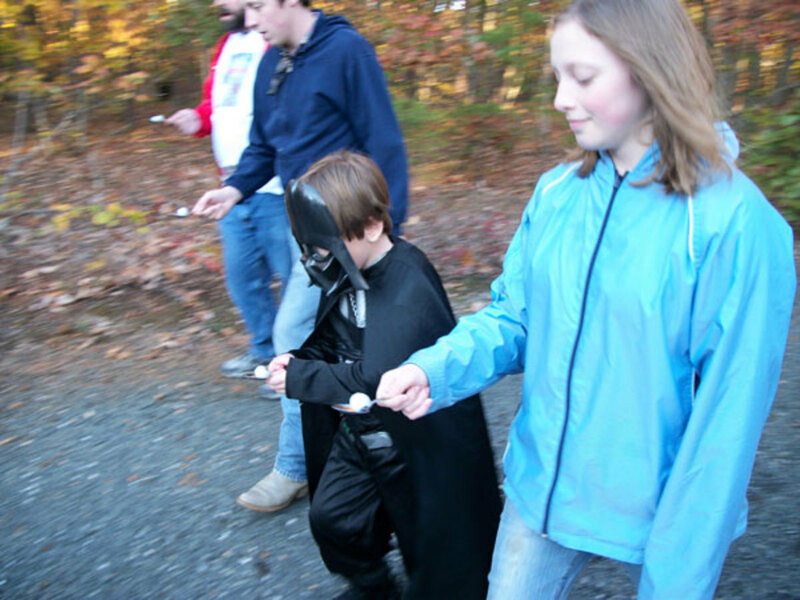 In this article I've shared some of the Halloween games and activities we've done over the years, including: Eyeball Race, Capture the Witch, Mummy Wrap Race, Costume Contest, Jack-O-Lantern Face Craft, and Halloween Movie Time. 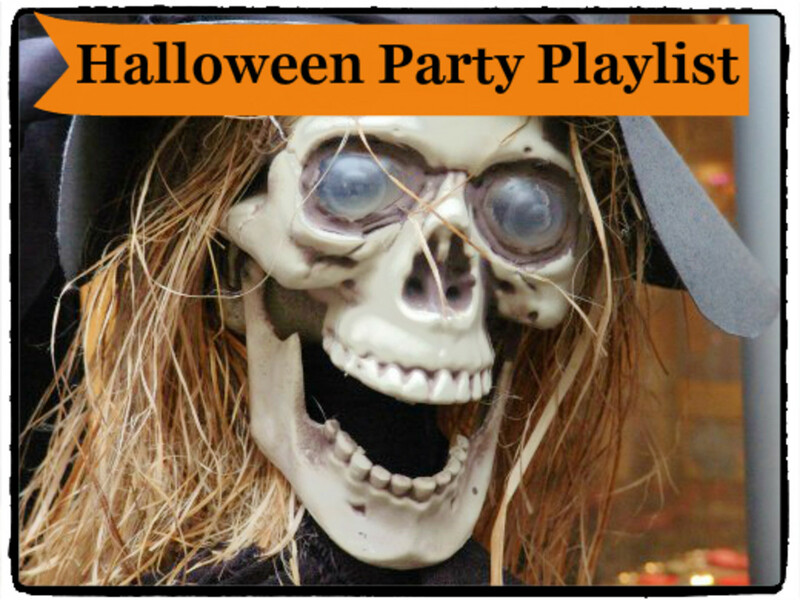 I know you'll have lots of fun trying out these ideas at your party. 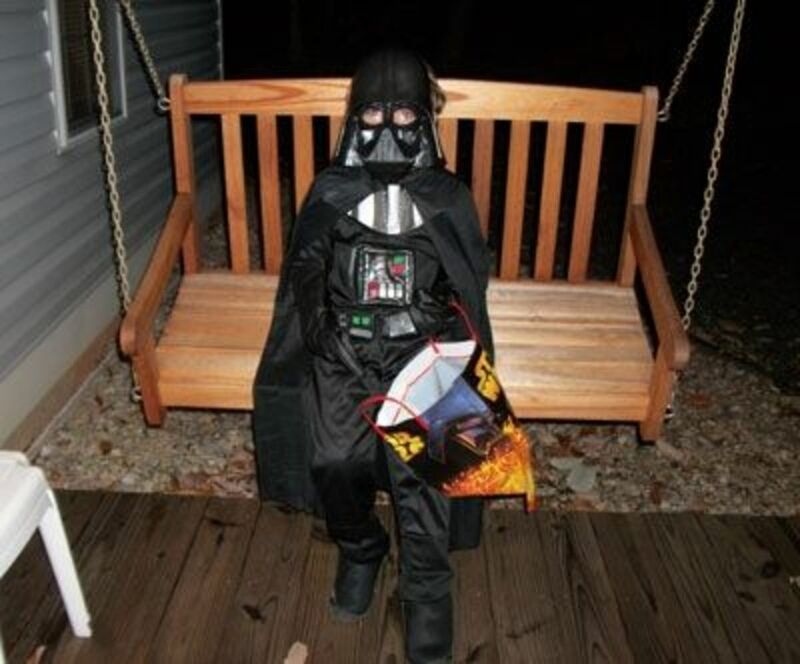 Darth Vader says: "Happy Halloween!" Do the kids keep the gumballs and eat them in the Eyeball Race or not? Thanks for your question. Usually, the gumballs or eyeball candy is wrapped. If you leave it wrapped it would be ok for them to keep and eat. However, you might wan to unwrap the ones you use for the game, in which case you would just throw them away. There should be plenty in the bag to give each child a few after the game. very nice and fun loving lens!! Fun..fun.. fun! ^_^ Thanks for sharing this one!